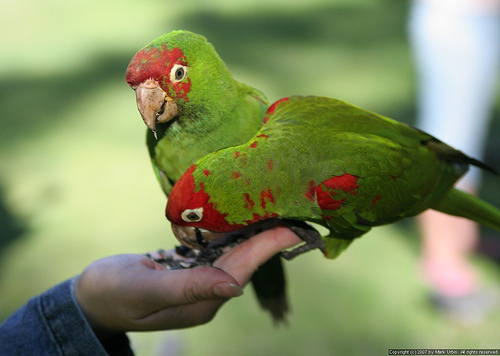 Training pet parrots has benefits that extend well beyond the entertainment value of a parrot that can talk and do tricks. Training will strengthen the bond you have with your parrot, who will look forward to the one-on-one attention involved in training sessions, especially when success means lots of praise and attention along with favorite treats. In addition, teaching some simple commands will make handling your parrot easier. Obviously, this is a bit simplistic, but your goal is to shape your bird's behavior into what you want by a giving a reward for good things and ignoring (no reward, no reaction) for bad things. 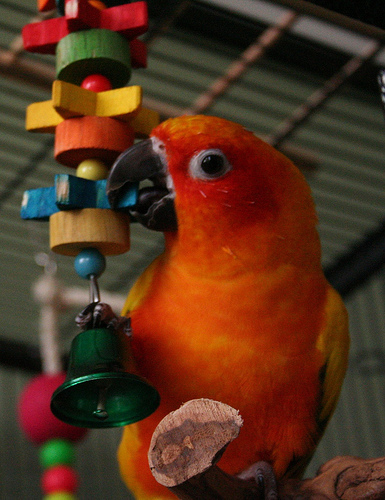 The reward can be a favorite food treat, but simple praise or a play session with a treasured toy can be good motivation for some birds. If your bird is doing something undesirable, you must simply ignore the bird (your bird will not respond to punishment). Train only when you are relaxed. Positive training does take patience! 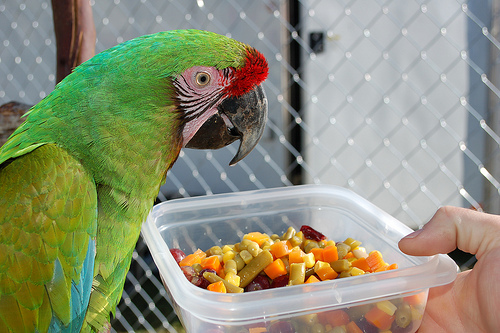 Pick a time when your bird is attentive and not distracted by eating, preening, or household activity. Frequent, but short, training sessions are generally more effective. A few minutes at a time, several times a day, works well. Pick a favorite reward (but don't overdo it if it is food). 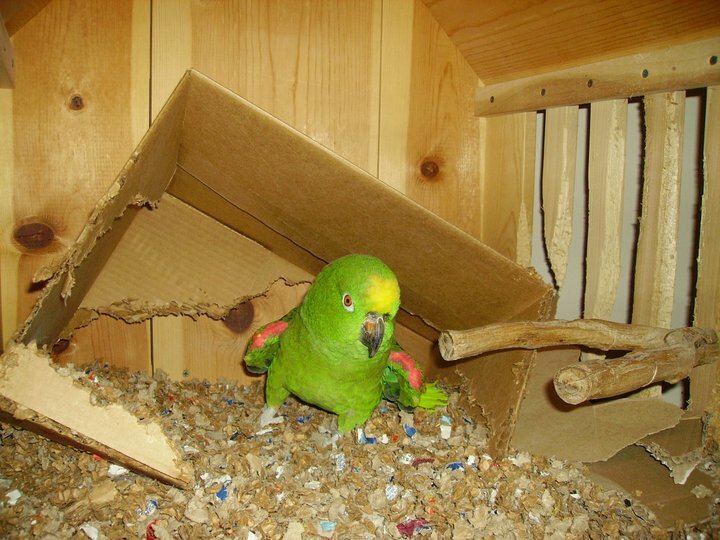 Once your bird catches on to something, don't give a treat every time (switch to praise part of the time) or your bird may only do the behavior if he/she knows you have a treat handy. End each session on a positive note. Wait for a successful attempt or at least a good try at whatever you are training, give a treat, and move on to something else. 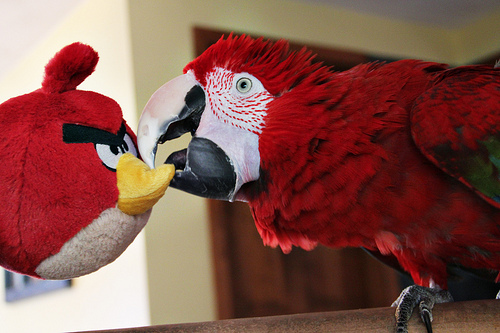 Keep training sessions upbeat and fun for your bird. If you had to choose only two things to teach your parrot, these would be then ones to pick. 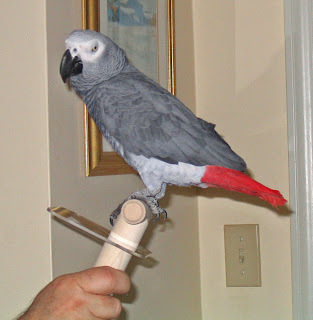 This means training your parrot to step up onto your finger or wrist (or hand-held perch) on command, and then step back off again. These are relatively easy and extremely important skills to teach. Stepping up is quite a natural movement for a bird so it is generally easy to train this on command (stepping down is a bit trickier to teach). Getting your bird to step up and step down on command makes handling much easier and helps you to set some boundaries for your bird (for example, you can more easily remove your bird from areas of you home that are not bird-proofed, return a bird back to his or her playgym or cage, etc.). If you have a baby bird, he or she is probably pretty cooperative but starting early with the step up and step down commands is still a good idea. Not only does training a cooperative baby allows you to give lots of positive reinforcement, it sets a good foundation for training more skills to your bird in the future.